A drive through a Los Angeles in the grips of gang warfare resembling civil war, Colors is a fragmented police drama that grinds the gears but can never quite achieve cruising speeds. 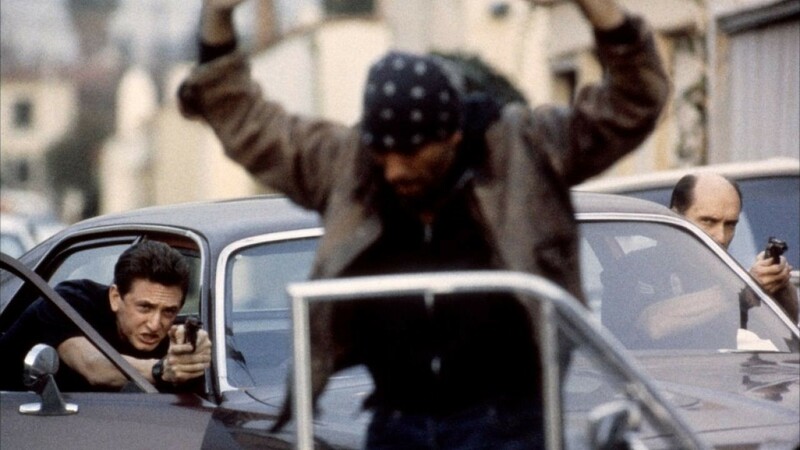 Officer Bob Hodges (Robert Duvall), a veteran member of the Los Angeles anti-gang unit, gets a new partner: officer Danny McGavin (Sean Penn) is young, aggressive and arrogant. The police force is unable to control a wave of extreme gang violence gripping the city. The gang members are heavily armed, and frequent drive-by shootings and revenge killings litter the streets with bullets and bodies. Hodges' style is to try and establish a rapport with gang members, turning a blind eye to minor offences to gain informants in an attempt to stop more violent acts. McGavin is less patient and more prone to breaking bones and taking prisoners. He also develops a romantic relationship with waitress Louisa Gomez (Maria Conchita Alonso), whose family members are involved with the gangs. Outnumbered and out-gunned, and despite endless patrol duty, neither Hodges nor McGavin are able to stop the violence from escalating. With gang leader Rocket (Don Cheadle) busy preparing retribution, the blood-letting will continue. Director Dennis Hopper finds the corners of Los Angeles that rival third-world slums, and sets the world of Colors deep within the grime. The aesthetics of the film are its greatest achievement. Hodges and McGavin patrol decrepit streets, depressed businesses, and dilapidated neighbourhoods, with gang graffiti on every wall, household debris cluttering every back lane and hoodlums hanging out on every corner, looking for trouble. It's as far from the American dream as a US city can get, and a most logical place for the breakdown of law and order and the emergence of the reign of chaos. In the face of a hopeless environment driving young men to violence, the cops are ridiculously ill-equipped to maintain some semblance of civility, and Hodges knows this. Too wise to pick a fight with every punk, Duvall gives a performance filled with resigned caring. Hodges is not cynical or hopeless, just a realist trying to find the thin streams of humanity among the mounting garbage. McGavin still believes he can make the world better by kicking it around, but all he succeeds in doing is spilling more junk onto the already filthy streets. Penn plays McGavin with belligerence but also a basic willingness to learn, slowly, from Hodges. Beyond the setting and the two main protagonists, Colors sputters, falling into repetitive patterns, gang members hissing at each other, routine car chases, repetitive drive-by shootings, and basic male behaviour uninfluenced by centuries of evolution. Some parts of the movie feel like a documentary, and attempts to capture the thread of a story or to humanize secondary characters fall short. Colors mixes vivids with pastels and oil with water. Some patches of the canvass reveal talent, but the overall product is a bit of an unseemly hodgepodge.